Toon Boom were kind enough to give me a 90 day Harmony Premium license for this review (Harmony is also available in Essentials and Advanced versions) but I thought, since they offer a free 21 day trial, I'll give myself that to write this review. Will it be enough to answer my two previous questions and is a 21 day trial enough for you to make a decision as well? To be clear, I'm not setting out to review features and compare them to other animation software I've used because Harmony is quite a complex animation studio. With virtually no prior knowledge of Harmony, how much could I seriously learn within 21 days to be able to say this is the tool for you? Watch Toon Boom's promotional video below. If it inspires you to know more then this review will tell you what's in store when it comes to trialing the product for yourself. The first hurdle is, who has 21 days to learn anything? It's more likely you'll get maybe five to seven non consecutive days to learn as much as you can before your trial expires. I think I managed about five or six full, non-consecutive days, before writing this review. I should say I wasn't expecting to learn everything but I was hoping to get an insight into the Harmony features that would make a compelling argument for me to adopt the software as my preferred 2D animation studio. Unfortunately I was barely able to scratch the surface of what Harmony has to offer in the time I was able to devote to learning the basics. It's likely that will be your experience too. In 21 days it's hoped you'll get a feel for what Harmony has to offer and be inspired to purchase a subscription. I did learn enough to see Harmony is definitely a formidable tool but at the same time, it can be completely overwhelming if you don't get the right introduction and pathway into the learning process. Although, at first glance, Harmony looks difficult to learn, with it's User Interface covered in icons for all manor of things, the basics can be learned very quickly. helped me learn some of the drawing tools. Being a visual person I gravitated towards Harmony's video tutorials. Specifically the ones linked from the software's welcome screen. This lead me to a bunch of video tutorials originally released for Harmony 12 but still very relevant to Harmony 14. If you need to learn Harmony fast, I cannot recommend these tutorials based on my own experience. I spent three days following the tutorial videos in order,watching 62 individual videos with a running time of 3 and a half hours before I decided I needed to look elsewhere. There were still more videos to watch but, after 62 videos, I still hadn't really learned the basics of putting together a scene, animating it and then exporting it to a video file. 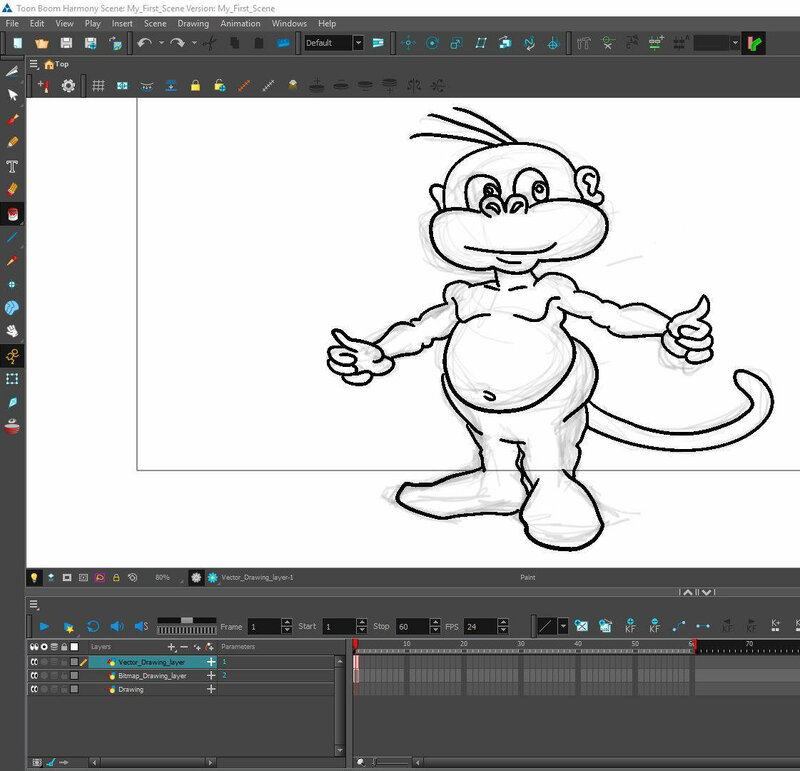 Learn Toon Boom Harmony in 30 minutes - Even if you've never animated before! The video by Jesse J. Jones, below, is the tutorial you need if you're trialing Harmony. I learnt so much from this in just under 30 minutes, covering more ground than those previous 62 videos did in 3 and a half hours. Jesse's video is a bare bones walk through of Harmony's core function, animating scenes. It's by no means comprehensive but, for a first look, you definitely feel like you're prepared to move on to more advanced concepts. After watching this I went back to the previous tutorial videos and followed through the one on Character Creation and Rigging with much more confidence than I had the first time. I created a character from scratch, using Harmony's drawing tools, and then rigged it without any difficulty at all after having followed the character rigging tutorial. My very first original character drawn and rigged in Harmony. Once you've done the above 30 minute tutorial a good next step is the Learn Toon Boom page of their website. Don't scroll the front page at all. Click on the start learning now link. Then click Harmony tutorial, followed by clicking on the version of Harmony you have. Finally click on the course its self and you'll be taken through a detailed project from start to finish, complete with videos, and the same course materials used by the instructor. If you follow along, and actually try out the things you're being taught, you'll need at least a couple of days to complete it (depending on how fast you work). At the time of writing this review I was part way through the Premium tutorials, attempting to construct my own scene with my own characters based on what the tutorial was demonstrating. You can see my efforts thus far in the screen shot below. 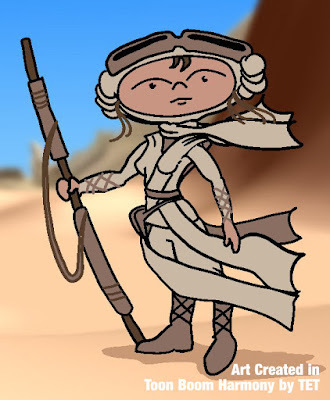 Rey from Star Wars Episode VII. How Much Did I Learn in 21 Days? The short answer is 'not enough'. Perhaps I would've gone further if Toon Boom's learning pathway from within Harmony its self was better targeted. The current video tutorial link is a complete miss for trial users and is better suited to beginners who have already bought a subscription. A basic understanding of the drawing and painting tools and that each frame has its own series of sub Art layers (Underlay, Color, Line art, Overlay) but the relationship between these from frame to frame and even layer to layer isn't quite clear to me. Harmony's old-school xsheet mark-up capabilities, making it great for traditional hand drawn animation if that's your thing. Rigging a character for cut-out or puppet animation including how to swap out body parts in character rigs for even more versatile characters. A basic understanding of the timeline and how exposure works in this software (why everything can't just be 'exposed' by default unless you manually turn it off (or un-expose it) is a mystery to me? The different types of layers on the Timeline including Bone, peg, sound and camera layers. Basic frame by frame and key frame animation with automatic tweening. Libraries and how to create custom palettes. I got a kind of introduction to the node editor, that's only available in the Premium version of Harmony. A kind of flow chart composite of your scene, it looked really powerful but the point at which I did the detailed, video tutorial on it was way too premature for me to put anything into practice. Overall I learned enough to animate a basic scene as well as I can in any other software, albeit with a little bit of revision over various tutorials to make sure I was doing things right. Below is my finished Star Wars, Scene which I completed, mostly without having to go back and re-watch tutorials. Though there was a few times I needed to revise on where to find various tools. As you can see I've got a brief camera pan and parallax effect. A rigged puppet character with robes blowing in the wind using deformations to animate them. If you look really closely you can see a slight deformation of the head and face at the beginning to give the impression the character is turning her head toward the camera. All the animation has been done with key frames and tweens. There's no 'hand drawn' animation at all. In the end I didn't really learn anything that would convince me hands down this is the software I should be using for 2D animation. I didn't learn any of the really great features you see in the Harmony demonstration videos. I mostly learned the way Harmony handles the same basic animation techniques I'm already familiar with in other animation software. Is Harmony easy to learn the basics? I actually think it is. Jesse J. Jones's 30 minute tutorial is proof of that. He teaches enough to give you a quick overview in a time that any software company should be pleased about. From that foundation you can then start to look around for tutorials that are specific to what you need Harmony to do for you (for me that was character rigging and from there I'd be going on to lip syncing). I'd probably start picking up more and more of the intricacies of the software as my confidence with it grew. I feel Toon Boom needs to create a learning path where you can learn the basics in an hour or less and then move on to individual tutorials that show how to do some of the more impressive things demonstrated in Harmony's promotional videos. For example, I would have liked to have added the light shading feature to my character animation but have yet to come across any kind of tutorial to show me how to do this. Is Toon Boom's Harmony something an independent artist/animator, like myself, should seriously consider as their go to animation studio of choice? Harmony is definitely a worthwhile investment if being a 2D animator is something you aspire to, either as a hobby or profession. 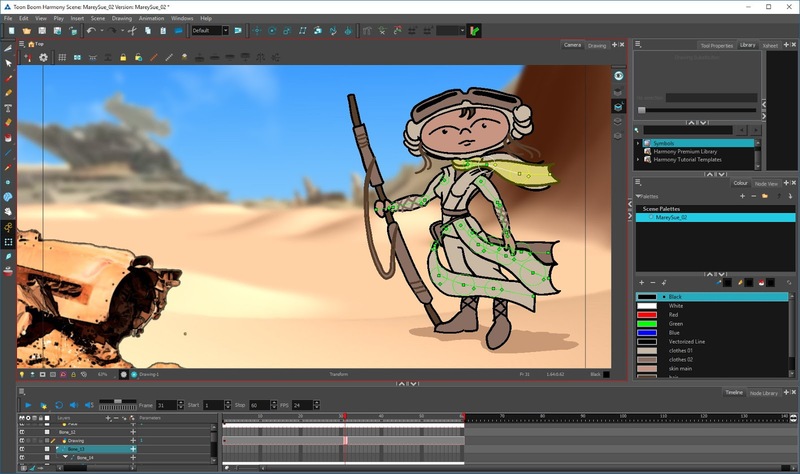 Toon Boom has a full range of subscription licenses making it affordable even on a modest budget. 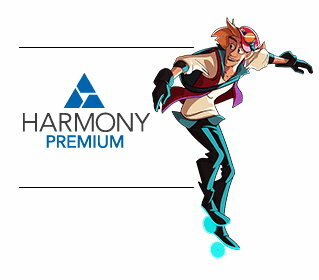 If being 'industry standard' matters to you then I'd definitely recommend Harmony for all your 2D animation. It's clearly capable and suited to most 2D animation styles and you'll always be prepared with options should you decide to freelance for studios or seek more permanent employment with an animation company. Since I'm the least 'Industry Standard' visual artist professional I know, that's not a concern for me. At heart, I'm more of an illustrator who likes to animate than a straight up animator. As much as I was starting to enjoy Harmony's drawing tools, I much prefer to draw in software dedicated to illustration. (My illustration software also can handle hand drawn animation too – so there's that). I don't doubt Harmony 14 Premium is really capable software. For me it just feels like too much for my needs. That may be reason to consider either Harmony Essentials or Advanced but I'm an 'all or nothing' kind of person. I prefer using the full versions of software rather than their 'light' versions. For me, Harmony isn't an essential tool, it's more of a luxury item. I would definitely use it but, based on my brief time with it, I can't say I've seen enough to be convinced my production schedule would be greatly improved over the software I currently use. I do believe Toon Boom Harmony 14 is truly capable of being able to handle most 2D animation techniques. Based on the demonstration videos it's easy to see why some animators swear by it and why it has become industry standard. Whilst Toon Boom have created several different learning pathways into Harmony for beginners, I feel, of the ones I experienced, they don't get you up and running with the basics quick enough. Personally I did not find the learning curve particularly difficult. The biggest hurdle for me was actually time. People often stay with the software they know because learning something new takes time. To me that's the issue with Harmony. The learning curve is only steep because there's so much to learn, not because the concepts themselves are hard. If Toon Boom were to take up my suggestions for how to implement their video tutorials, so anyone trialing the software could get to the impressive features quicker, I think they'd give people a very compelling reason to buy a subscription license. Hi David, great review on Toon Boom! I have been looking around for animation software to create animation content for my kindergarten class for a while now. I was thinking of getting CTA 3 but the fact that I haven't been able to find any decent quality cartoons created with that software have got me hesitant if that's the right software for me. I have only been able to find short sequences (1 min clips) created with that software that looks good and I am looking to create 15-20 minutes long cartoons. I know ToonBoom has that ability but it might be a little overkill and a time drain for me since I know it's used by professional animators. Don't get me wrong I am prepared to spend some time to learn an animation software but my goal is to have a created a couple hours of animation content by the summer. Nothing super advanced but good enough of a quality to keep the kids attention:) What do you think is the best course of action for me? Is my worries about CTA3 valid or I am missing something? What do you think is the best 2d animation software for me? Is there maybe a 3d animation software (like Maya) that would be a better fit? Sorry for all the questions but this blog seems to be the best resource online to get the answers that I seek. Do you know of any active forums that I might be a good resource? Thanks for a great blog and hope to hear back from you! Happy holidays, Maddie. Most professional and semi professional animation software is intended to be used as 'scene editors'. The intention is to construct animated scenes of no more than a few minutes long, render them out as video files, then bring all your individual scenes together with video editing software (any video editor will do - I use Serif MoviePlus X6). This allows you to build longer animations, up to feature length if you want, and gives you all the additional effects and features of your video editing software like adding transitions and titles etc. Animation is not, generally a quick medium. Putting together a 2D animated short of 15-20 minutes by this summer would be ambitious even at basic quality (and you've said a couple of hours by this Summer). I'm not saying you couldn't do it but it will keep you busy... especially if you have to learn the software too. 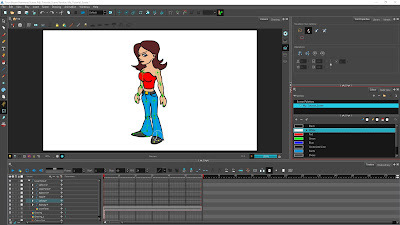 Toon Boom Harmony is top of the line 2D animation software for professionals who can create their own content from scratch. It has a lengthy learning curve and probably isn't a good starting point for someone who wants to be up and animating quickly. 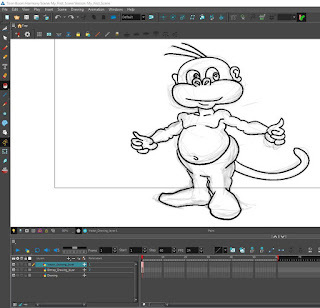 Moho (formerly known as Anime Studio) is the better option if you want similar features to Toon Boom Harmony but again it's geared towards making content from scratch - Though you can buy theme packs of characters and sets for it and it does have a character creator that can speed up production some what. Personally I think CTA3 is ideal for your needs. You can make animations using your own art or take advantage of a whole market place of content from various creators to save you time. It's also the fastest and easiest software to learn compared to others mentioned here. I don't know what example animations you've seen but if you haven't checked out Garry Pye's content and animations I'd say, they're a good example of, TV quality cartoon animation as you'll find with CTA3. His 'Little Mates' content would probably appeal to Kindergarten aged children too. Check out his Youtube channel where you'll find links to his Facebook page and CTA store as well. PS... I don't have experience with Maya but if you did want to go 3D, iClone is the better option. Like CTA3 it's easy to learn the basics and has access to plenty of pre-made content in the Reallusion Market place. Reallusion's forums are a good resource for all their software. I've yet to come across an animation forum that I could recommend as a more general resource. Your blog has been so helpful to me in choosing a software to do short animations. Do you think CTA3 is ideal for creating my own custom characters (that I draw)? It seems as if the options are limited to buying their character packs or using their template to create a character from their pre-designed hair, nose, body, etc. And can I capture external motion from a device such as Kinect (I know iClone allows it)? I am trying to decide between it and ASP12, but am having a hard time finding that "right" training tutorial that guides me from beginning to end and helps me complete a small animation. I also appreciate the time you took to organize the list of tutorials from MOHO. Glad you're finding my blog useful. CTA3's new G3 characters make it easier than ever to create characters from your own drawings, though there is still a bit of a learning curve on creating G3 faces/heads it's still much easier than the G2 characters introduced in CTA2. I've never used Kinect for motion capture but, as far as I know, if you have the Pipeline version of CTA3 and have iClone with the Kinect plug-in you will be able to import motions created in iClone to CTA3. (There's no direct Kinect plug-in for CTA3 as far as I know). That said, motion files imported from iClone can only be used with CTA3 G2 characters as these simulate 3D movement in a 2D environment. As I eluded to earlier, G2 characters are much harder to create as they are multi-angle characters. The new G2+ characters in CTA3 simplify head creation considerably but it still takes some time to set them up due to the multi-angle nature. However, if you have the time to learn how to create a G2+ character, I'm not aware of any other animation software that has anything near as comparable - not even MOHO with it's multi-angle character creator. Speaking of MOHO, I'm still working my way through the video tutorials. Unless you think you really need MOHO's advanced features I'd suggest CTA3 is the better option. So much easier to use. Thank you so much! You have provided me the exact information I have been seeking. I appreciate your detailed response and based on it, I am going to sample a trial of CTA3 and then see if the tutorials are useful. That raises another concern for me. I didn't see a large amount of helpful tutorials or courses that teach CTA3, but hopefully I can get pointed in the right direction with the tutorials on the Reallusion website. Thanks again and Happy New Year! Again, glad I could be of help. Bare in mind CTA3 was only released in Dec 2016 so official tutorials are still being rolled out. You'll find all the official video tutorials linked here. It may even be worth browsing through CTA2's tutorials (found here) as everything is still relevant due to CTA3 mainly adding more functionality and not really taking away any previous functions. The UI is basically the same too. Thanks so much!! I had seen the tutorials in your second link, but not the first...not sure how I missed it on their site, but thanks a bunch!! If you ever decide to create a CTA course, I will be the first to purchase it! :) Take care! Update: Thanks again for your help! I must admit, I am impressed by CTA3's features, but not so impressed by their training available. For the most part, I am told more training "is coming." In my opinion, ASP11 has more training available and now that you helped me to organize it, I think it is "doable." I would really love to use the CTA3 drop and drag features for motion, etc, but I have this trial with no direction and find that I am self teaching (which I hate to do with software) or randomly looking for videos just to simply teach me how to use the software. The tutorials on their site for version 2 don't always apply to 3 and then I become confused, and not only that, the tutorials that I watched, the guy is fast paced and either skips some things or assumes users already know. I use a drawing app to draw my characters. I am thinking to use ASP but avoid its drawing tools (which has been the most difficult for me), and import my character in PSD format and then animate it in ASP. What do you think of ASP's animation ability and the learning curve in the way I would use it in that sense? I may give it try. I see more shorts online made with ASP vs CT (with the exception of Gary Pye) and that may possibly be because of the lack of adequate training...not sure. ASP (or MOHO as it is known now) has been around much longer than CTA. MOHO is on version 12 where as CTA is only on version 3. That's more likely the reason you see more ASP animations and more tutorials etc. From what I know of ASP (bearing in mind I only started learning it properly when I started blogging my progress) is that it's far more work to set up and animate a character compared to CTA3. I also feel like with ASP you spend much more time animating through menu selections and settings than you do actually interacting with your characters on the stage. Honestly, if you're struggling with CTA3 ASP/MOHO is going to be even more confusing for you. if you're going through the same tutorials I am - it's going to take you a lot longer to learn anything useful like how to create and save motion files (which I'm surprised I haven't come across yet given the number of video tutorials I've completed for MOHO thus far). I don't find the CTA3 video tutorials fast paced at all. Seems to be about the same pace as ASP video tutorials. In both cases if I miss something or don't understand whats going on I just pause and replay the bit I didn't catch the first time. I do think if you stick with CTA3 you'll be glad you did. Particularly as the next upgrade will include the ability to import characters created in photoshop directly as a PSD file, with support for layers, masks and grouping (though this feature is 3-4 months away yet). I'd also recommend frequenting Reallusion's CTA3 forum (you'll find it under the community section of their website) as you can find a lot of answers and get answers from other users. Gary Pye is also a great resource and is very happy to offer help to anyone learning CTA3. His Facebook Page is a good source of tips, advice and the easiest way to get his attention. He's also a Photoshop die hard so could give you plenty of tips for using Photoshop with CTA3. All I can really do is reiterate, if you think you need all the advanced features of ASP/MOHO then it's a much more capable and versatile software than CTA3 but it's also much harder and takes longer to learn. It has settings for just about everything and has features not present in CTA3 like physics, particle and even simple 3D animation. 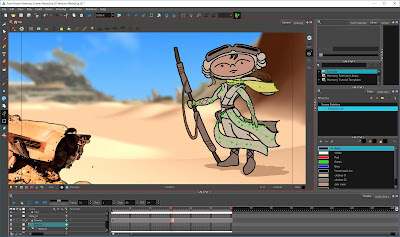 If you want something that's going to help you get a finished animation up quickly and don't need so many bells and whistles then CTA3 is easier and quicker to learn and a little more structured in its approach. I know 'easier' seems a little unbelievable to someone just starting with the software but it's relative to ASP/MOHO. Right now I'd have to rewatch quite a lot of those MOHO tutorials to animate anything in MOHO well because there is so much to remember and I've forgotten quite a lot of it already. David I had a feeling you would be able to shine some light on Toon Boom. I actually read this post last week, but was unable to comment. Your review as well as the comments from others and your own have been extremely helpful and have given me some things to think about. I am off to look at your info. on CTA 3 now. I'm glad you found this post useful (considering how much research/learning I had to do to write it). Are you getting back into creating animation then? Very useful. I can believe you put a lot of time into it. The same as you do with this blog David. Still considering Harmony, but we will see. Yes, I am definitely getting back in to animating. It has been too long. I miss it on many levels.